Imagine if you never brushed your teeth or had them cleaned. Pretty frightening, right? Eventually, things would start to go very, very bad inside your mouth: teeth would rot and decay and gums would become inflamed and infected. Bacteria from those rotting teeth might even start to travel to your bloodstream and cause other serious health problems. And we haven’t even mentioned how painful your mouth would become. Following American Veterinary Medical Association guidelines, Bell Veterinary Hospital only does cleanings and dental work on anesthetized pets. To ensure your pet is healthy enough to undergo anesthesia, we do require a routine blood test before the procedure. Preventive dental care can begin with brushing your pet’s teeth at least three times per week to prevent plaque and tartar build-up. Interested in learning how to do it? Just ask and our veterinarians will be happy to help you get started. 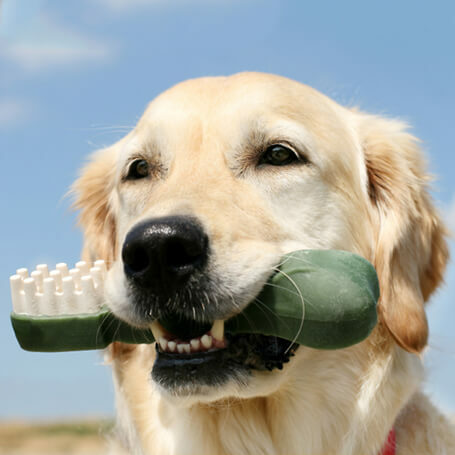 If you have a pet that won’t tolerate brushing, our veterinarians can also recommend products that will help keep your pet’s mouth healthy in between cleanings. If your pet has any of these symptoms, it’s time for a dental exam! Don’t wait—severe oral health problems can be painful for your pet. Schedule an appointment online or call us at (205) 709-8286.